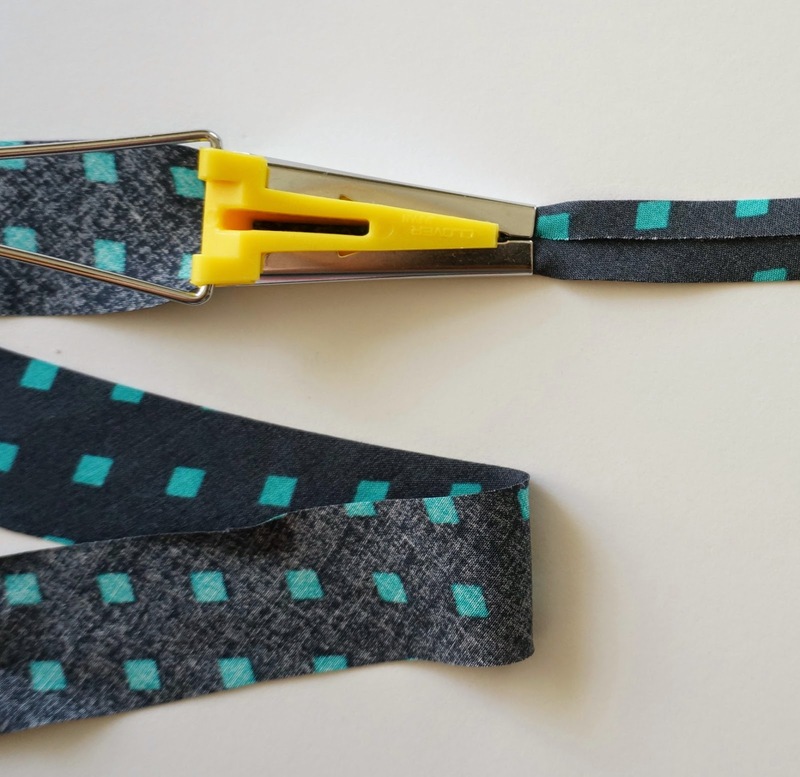 Sewing binding can be downright tricky, but if you follow my tutorial I promise you will never be intimidated by sewing binding again! 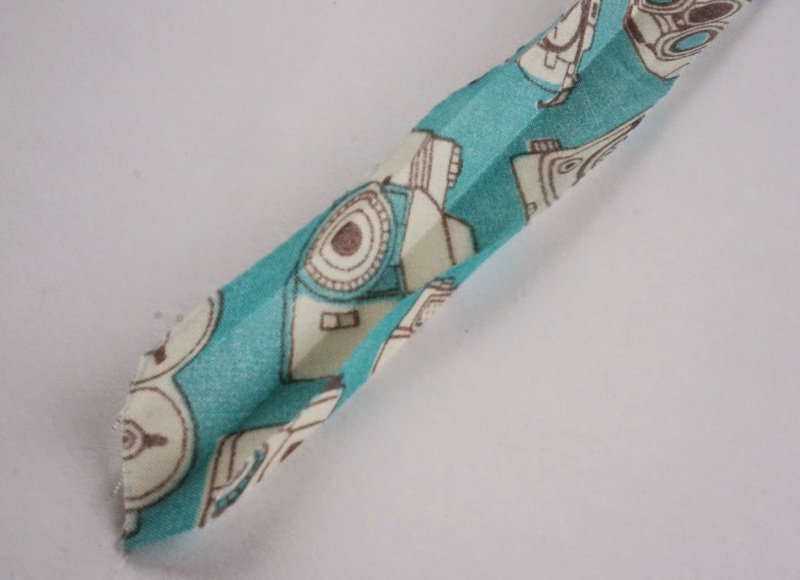 I also use this method for sewing small fabric accessories including potholders and placemats. You can a tutorial for adding bias binding to round potholders HERE. 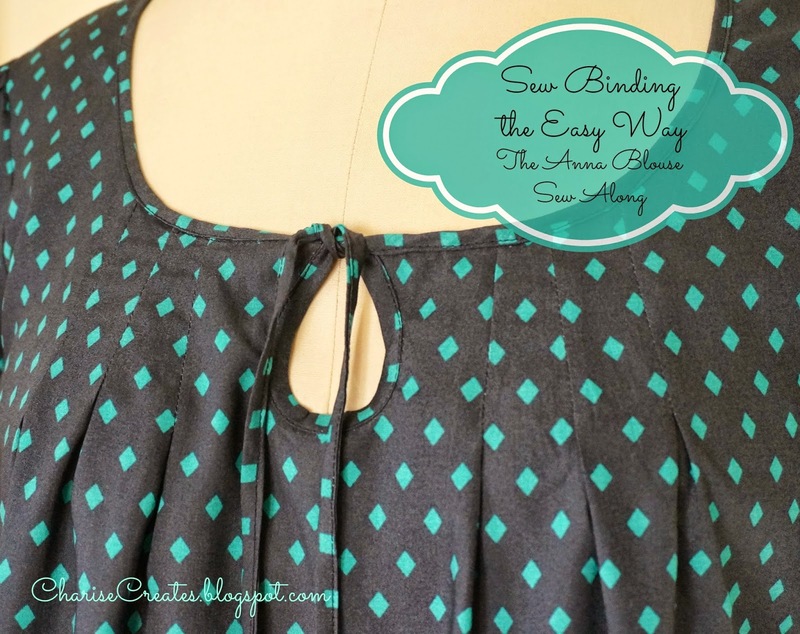 Today I will share a tutorial for making and sewing on the binding on your Anna Blouse. I find it easiest to sew the binding if the fold marks are creased prior to sewing on the binding. 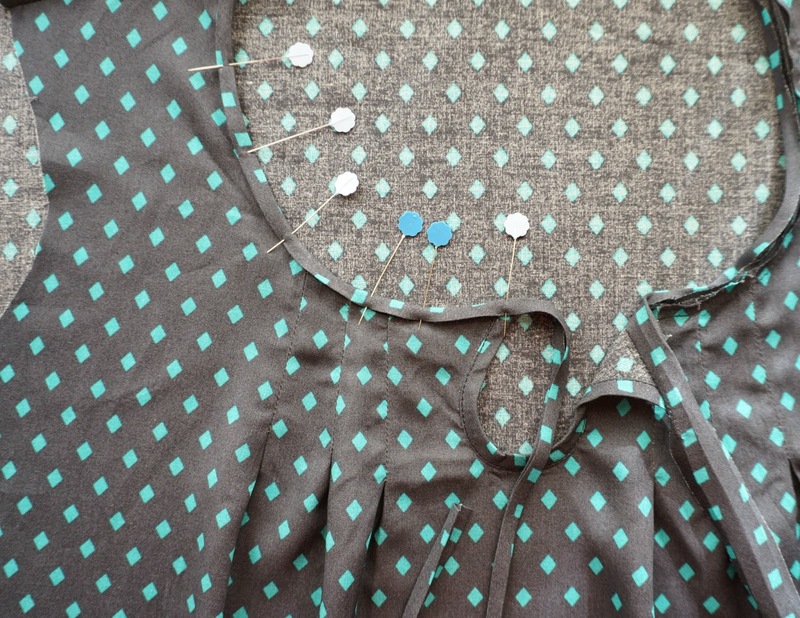 It is especially important if you are sewing narrow binding like the binding on the Anna Blouse. Stitch the Center Back Seam. Unfold the strip. 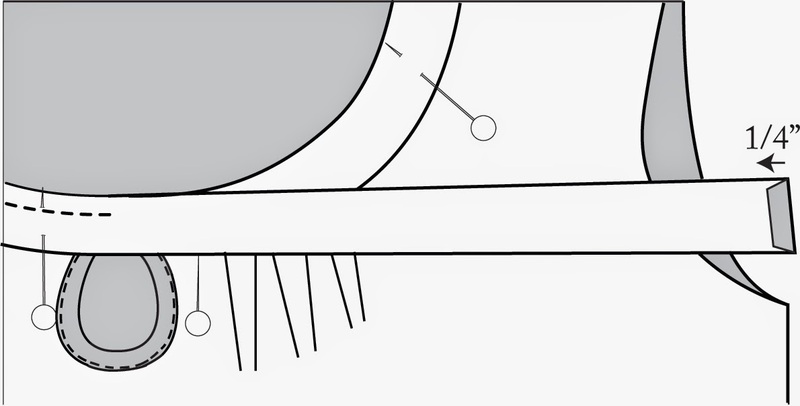 Match the raw edge to the center crease and press. Repeat for the other side. My favorite way to prepare binding is to use a binding tool. 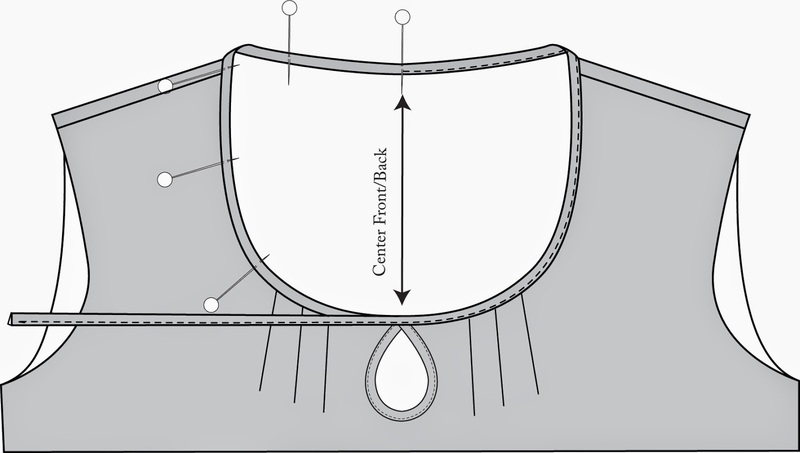 You will need a 1/2" flat fold binding maker for the Anna Blouse. First, Sew the Center Back Seam. Feed the binding strip through the binding maker. Press in half. I like to compare the length of the prepared binding to the pattern. If the binding has stretched a bit, cut to the pattern length. 1) Place the binding right side to the wrong side of the blouse. Match the Center Back, Shoulder and Center Front (CF) notches. Pin in Place. 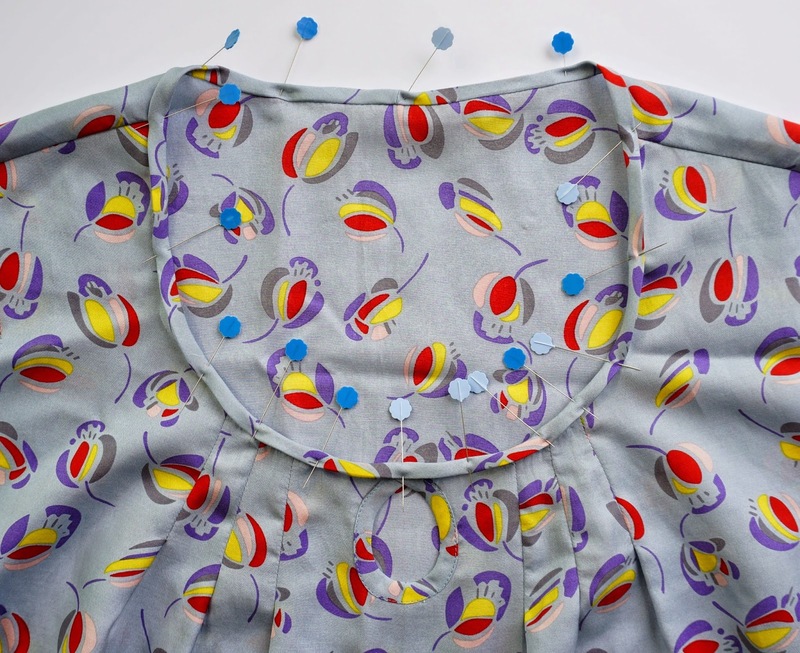 With the binding facing you, Start stitching at the Center Back. 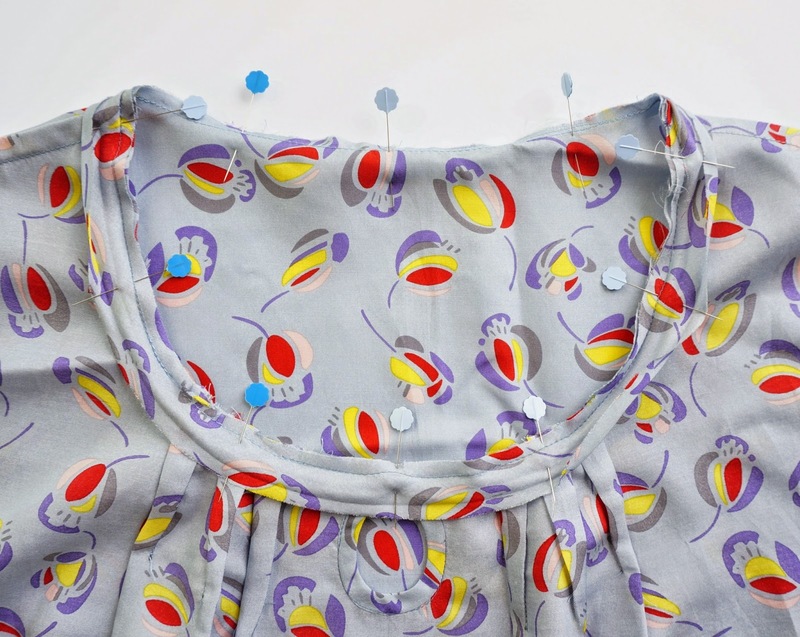 Stitch around the neckline until you reach the CB. 2) Fold the binding over to the right side folding under 1/4" on the pressed line. Pin in place being sure to cover the previous stitching. I like to lightly press the binding in place. If you have a tailor's ham, place the ham under the binding and Pin in place. Press lightly. 3) Edge stitch along the fold starting at CB and continuing around the binding to CB. Back tack at ends. 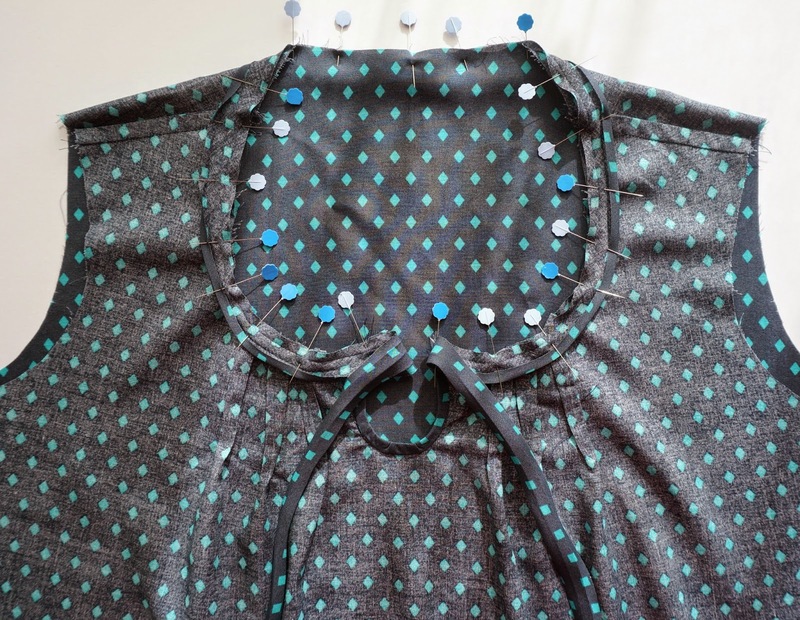 2) Place the binding right side to the wrong side of the blouse. Match the Center Back, Shoulder and CF notch. Pin in Place. 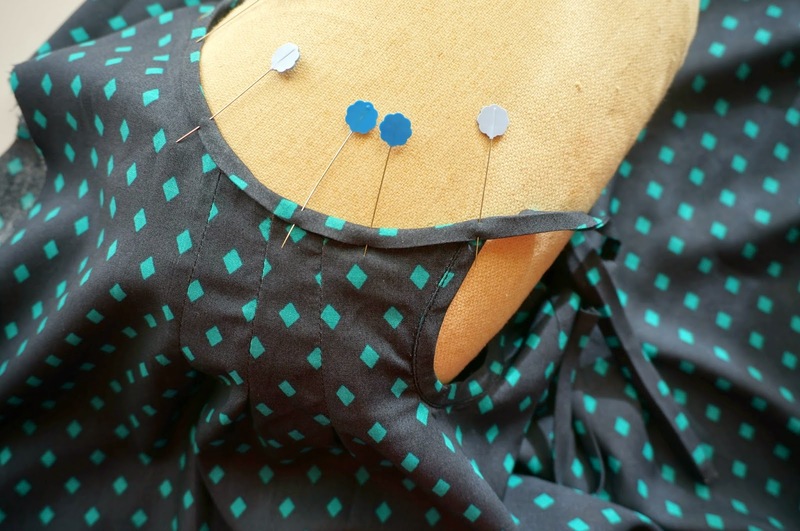 Starting at CB, stitch around the neckline until you reach the CF. Back tack at ends. 3) On the short end of the neck binding, fold under 1/4" and press. Repeat for the other side. 4) Fold the binding over to the right side folding under 1/4" on the pressed line. Pin in place being sure to cover the previous stitching. Press lightly. Repeat for the other side. 5) If you have a tailor's ham, place the ham under the binding and Pin in place. Press lightly. 6) Starting at the CB, Edge stitch along the folded edge to the end of the tie back tacking at both ends. Repeat for the other side of the neckline. Press.